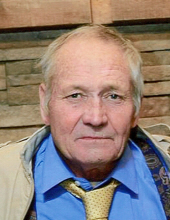 Tommy M. Perry, 66, of Tower Hill, IL passed away at 1:10 p.m. on Monday, March 25, 2019 at HSHS St. John’s Hospital in Springfield, IL with family by his side. Tommy was born April 23, 1952, in Pana, the son of Lloyd and Clairbelle (Cloe) Perry. He was a veteran of the United States Army and was a member of the International Horse Racing Association. Tommy had a passion for racing horses, target shooting and the outdoors. He is survived by eight children: Shane Perry, Amy Schneider, Vickie Giannuzzi, Heath Perry, Tommy Perry II, Hayley Campbell, Nolan Perry and Cheyenne Siuba; 24 grandchildren; many great-grandchildren; brother, Larry Perry; sister, Penny Perry; and his beloved four-legged children: Auggie, Emma and Frosty. Tommy was preceded in death by his parents; wife of over 30 years, Edith (Ginger) Perry; son, Larry Don Perry; two brothers: Lloyd Wayne and Gary Paul. Funeral services will be held at 3:00 p.m. on Saturday, March 30, 2019 at Lockart-Green Funeral Home in Shelbyville with Pastor Derrick Ritchie officiating. Burial will take place in New Hope Cemetery in Tower Hill. Visitation will be from 1:00 p.m. until the time of service at Lockart-Green Funeral Home in Shelbyville. Memorials may be made to the family. Family and friends are invited to light a candle or share a story in Tommy’s honor at www.lockartgreenfuneralhome.com. To send flowers or a remembrance gift to the family of Tommy M. Perry, please visit our Tribute Store. "Email Address" would like to share the life celebration of Tommy M. Perry. Click on the "link" to go to share a favorite memory or leave a condolence message for the family.